Baja California - On tour in the state, the president inaugurated the Mothers’ and Children’s Hospital and the Oncological Specialties Hospital in Mexicali. Later on he visited the expansion of the Río Colorado-Tijuana Aqueduct and the Mexicali-San Felipe and the El Faro-Murguía-Guadalupe Victoria roads. His last commitment for today is a meeting with economic and social leaders. During the inauguration of the Mothers’ and Children’s Hospital and the Oncological Specialties Medical Unit, the president stated that since it was announced that the Popular Insurance Scheme would pay for cancer-related expenses in children aged up to 18, 7 out of every 10 children with leukemia have taken the opportunity to be cured and rebuild their lives, since their families are entitled to total coverage of the treatment. This, together with the hospital works inaugurated, will ensure the peace of mind of thousands of persons, by facilitating the diagnosis and treatment of various diseases. 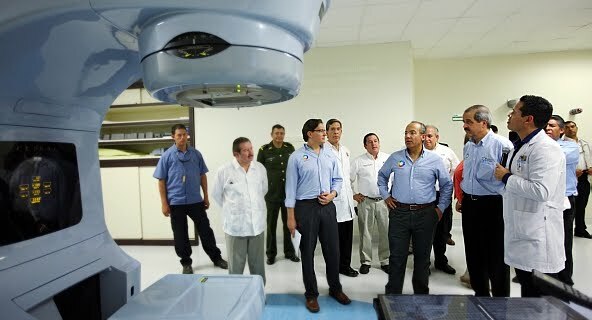 On the subject of access to health, President Calderón said that this has been his government’s priority, an ideal enshrined in the Constitution years ago, which is now materialized in all Mexicans, regardless of whether they are rich or poor. Before continuing with his activities, the president declared that this year, Mexico will achieve universal health coverage. At the same time, investments in infrastructure for sustainable water use are part of the efforts to encourage a culture of water conservation, said President Calderòn. The Expansion of the Río Colorado-Tijuana Aqueduct solves the water supply problem in the municipalities of Tecate, Tijuana and Playas de Rosarito. Increasing the current supply of water by over 30% will improve the living standards of nearly 1.3 million residents of Baja California. Lastly, the president said that the authorities have worked to modernize Baja California’s highway infrastructure: the inauguration of the Expansion and Modernization of the El Faro–San Felipe and El Faro–Murguía–Guadalupe Victoria highways will improve communication in the Valley of Mexicali and increase its safety and speed on the coast of the Sea of Cortés.